With spring practice underway, the timing is opportune for Ron Cherubini to delve into the good, the not-so-good, the unknowns and the possibilities surrounding East Carolina football. Part I provides an introduction and focuses on the offensive unit. Part II analyzes the Pirates' defensive strengths and weaknesses. In football terms, it is also debatable whether or not the East Carolina football team that won the 2008 Conference USA championship and narrowly lost the Liberty Bowl was really “stronger” than the team that lined up and smacked Virginia Tech and West Virginia in the mouth in the first two games of the season. But what is most certainly Nietzshe-esque of the ECU football program is that, through an unprecedented number of season-ending injuries and two too many off the field problems, the future of ECU football may never have been this “strong” in its history, from many perspectives. Where the 1992 Peach Bowl champions were dominant on the field, the program was equally hampered in the wake of that season. The coach fled the scene and too much of the talent and experience on that team departed upon graduation. This time around, the coach who has built the program up is still firmly in command and the sheer number of talented, experienced players returning to the program for the 2009 campaign is unmatched in this writer’s years following the Pirates. And there is more: This youth and experience has also played football under the brightest spotlight ever shown on ECU – including the 1991 team. These kids have played on national TV in spotlight games – winning three of four of those – and brought home a championship. While expectations for the 2008 team were to get to the C-USA title game, next year’s goals should be much higher, rightly so. This team should expect to win another conference championship... should expect to win the Liberty Bowl... and should expect to finish the season ranked among the nation’s best teams. There is that kind of talent returning. And, I suspect, with all of the attention the team garnered this season, the team shouldn’t have to climb far to get into the Top 25 early in the 2009 campaign. With this in mind as spring ball begins in Greenville, let’s take a close look at those players who are back in the fold for 2009. The offense would be an utter disappointment if it does not drastically improve on its 20-something average points per game in 2009. With quarterback Pat Pinkney’s return to the lineup following NCAA approval of a rare sixth season, the offensive playbook should have no plays held back in 2009. While there are some questions on depth at tackle and a gaping hole at tight end following the graduation losses of Davon Drew and J.R. Kraemer, overall, across the units, there is talent, experience, and depth. There is also a huge task ahead in finding a replacement for four-year deep snapper Wilson Raynor and potentially holder Joe Sloan, who may not return in 2009 after having graduated. Patrick Pinkney (MH-Sr): ECU got a late Christmas present with the news that the senior quarterback and 2008 starter would return in ’09 via a medical hardship waiver. Pinkney improved greatly from his 2007 to 2008 campaign and will improve more going into his final season. The Pirates offense could not have wished for a better situation going into what should be a great season on both sides of the ball. Rob Kass (RS-Sr): The strong-armed quarterback has been patient, a team player, and ready to play when called upon since losing the position he earned in the spring of 2007. If he does not lose patience or faith knowing he will backup in his last season, Kass will provide the Pirates with a high quality backup who could be a quality starter should he be called upon. Josh Jordan (RS-Fr): Having been described as a combination of Kass’s big arm and Pinkney’s elusiveness, there are high hopes and expectations for Jordan’s future as an ECU signal caller. He is still a year out and better be if ECU expects to have the season it should have in 2009. While talented, freshmen are still freshmen and you rarely contend for championships with one at the helm. Jordan’s path should be set on 2010, but for 2009, he needs to be a viable backup for Kass or Pinkney should an unanticipated situation arise. Position Analysis – With Pinkney under center, his key weapons back in place and newfound depth in the receiving corps, the offense should be primed for a breakout season. 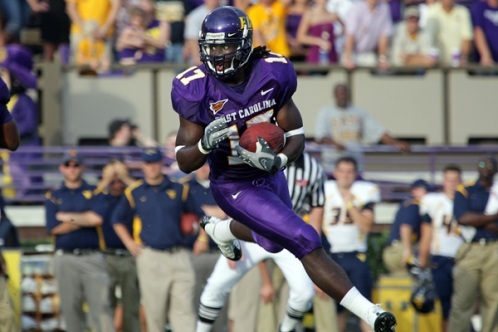 Pinkney will likely etch himself into the ECU record books in 2009. Kass is a high-quality backup and Jordan could not ask for a better situation for being mentored while waiting to battle for the 2010 job. The quarterback position is as strong as it could be for the Pirates. Dominique Lindsay (RS-Sr): Tabbed the starter going into the 2008 season, Lindsay was lost for the season in pre-season camp. Strong enough to bang inside and quick enough to get to the corner and make a big play, Lindsay gives the Pirates a bonafide No. 1 running back, if he is fully rehabbed from his injury. Norman Whitley (RS-Jr): Though he was fourth on the depth chart heading into 2008, Whitley was expected to be a difference maker in the backfield. He demonstrated that he has big play ability taking both a pass and a run over 50 yards for a TD. He carried the load at the end of the season and brings a load of experience back in 2009. Whitley will have to battle being tagged a fumble risk (he led all ECU backs in fumbles/fumbles lost with 4/3) and there are questions about his status, but his talents are no longer a doubt. J.R. Rogers (RS-Sr): After fighting through an early-season injury, Pirate fans finally got a glimpse of the speedster’s abilities to get through a small opening and hit the gas for big yardage. Rogers will provide high quality depth for the Pirates and can take the full the time role if needed. Jonathan Williams (Jr): If Williams is welcomed back onto the team (his legal issues are well-documented), his talents are certainly welcome in the backfield. Despite his troubles off the field, Williams is still largely hailed as the most talented back in the program. He has shown a brutal toughness in the middle, the type of moves to make people miss and the type of speed to take the ball to the house from any distance on the field. Kevin Gidrey (Jr): Gidrey has been the model of consistency at fullback for the Pirates. He is a veteran now, seasoned and well-versed in the offense. Gidrey provides the big, bruising lead blocker that is necessary when the Pirates shift into the I or are looking for critical short yardage. Unless he is moved to TE to sure up that position, Gidrey will have no competition for his position in the Spring. Ben Herlocker (RS-So): Highly regarded out of high school, Herlocker is still a bit of a mystery in terms of rating his potential at fullback. He is tenacious and skilled, but may not have the bulk needed to dish out the punishment required play after play when the Pirates shift into the I. His agility, however, would give the Pirates an additional, viable pass-catching back out of sets that utilize a fullback. Game experience is truly what will determine Herlocker’s future in the backfield. Position Analysis – With the exception of Gidrey, every other running back has a big question that they must answer before the position will be considered solid. For Lindsay, the question is whether or not he has recovered fully from a serious injury. For Whitley, can he prove that he can protect the football? For Williams, will off field problems take him off the field? For Rogers, is he durable and experienced enough to carry the load should it be necessary? From a talent perspective each of these backs has proven that he is capable of being a standout by any measure. If these young men can answer those questions, then the Pirates will have an enviable situation at running back. If at least one or two of them cannot overcome the question marks, then the Pirates may find themselves playing running back by committee in 2009. Dwayne Harris (Jr): ECU’s most dynamic player will be back to lead a very talented corps of receivers. Harris – who once again went over 1,000 all-purpose yards in 2008 despite an injury – will be one of the top targets in the passing game, will return kicks and will be the x-factor again for the Pirates. Jamar Bryant (Sr): Bryant again will be one of the finer receivers in C-USA, providing not only a solid deep threat but also stellar downfield blocking. His off the field misstep – which cost him half of the 2009 season – will likely only re-focus the talented receiver to put together the type of season that could draw NFL attention. Alex Taylor (Sr): Most in the Pirate Nation starting to wonder if the tall, lanky Taylor was ever going to break out or be a bust. In 2008, after the team lost the services of its top two receivers, Taylor found himself as the primary receiver and he delivered big-time, performing like a starter. He has shown that he can make the clutch catch, can go up and get the ball and be dependable as a pass-catcher. He also showed signs that he can be a leader in the receiving corps. Taylor will be a fantastic part of the rotation in 2009. Darryl Freeney (RS-So): Freeney broke onto the ECU receiving scene out of duress following injuries and suspensions that laid waste to the depth chart. He capped his fine RS-freshman season with an 80-yard TD reception in the Liberty Bowl. A lot of expectations existed for Freeney prior to the season and the young pass catcher delivered like a seasoned-veteran, demonstrating the ability to get open and to make big plays. Most importantly, he got repetitions in big quantities against quality competition, giving the Pirates unprecedented depth at the position. Joe Womack (So): While no coach likes to lift a red shirt for less than half a season, need dictated otherwise in regards to Womack. Womack demonstrated as a true freshman that he is a player. He flashed glimpses of big-play ability and physical toughness, adding high-quality depth to the ECU receiving corps. Michael Bowman (RS-So): Though he finally saw action at the tail end of the season and mainly as a kick returner, he demonstrated break-away speed and a shiftiness that will help him offset his lack of size. Bowman provides a home run hitter for the Pirates in the kick return game and in a reserve receiver role. Reyn Willis (TR-Sr): He got on the field right at the end of the season, picking up game reps that will be valuable heading into next season. Willis should provide quality depth for the Pirates. T.J. Terrell (TR-Jr): After a great spring in 2008, Terrell fell off the depth chart (managing one catch in the first three games) and stayed off the field following a knee injury in the third week of the season. The Nicholls State transfer has the talent to make an impact, but it remains to be seen if he will be a factor in 2009. At the least, he will provide more quality depth for the Pirates. Position Analysis – The receiving corps was devastated in 2008 when Dwayne Harris and T.J. Lee were lost to injury and top target Jamar Bryant was suspended for violating team rules. Young wideouts like Darryl Freeney and Joe Womack were pressed into starting roles earlier than planned. That will pay off in 2009. With the return to the fold of Harris and Bryant, Alex Taylor’s emergence and the experience gained by the young wideouts, the Pirates should be more than loaded at the position in 2009. It is likely that another one or two of the younger receivers – like Javon Brumsey or D.J. McFadden – will emerge, and 2008 signee Dayon Arrington is expected to immediately contend for playing time in 2009. This position is solid from top to bottom for the Pirates next season. Willie Smith (Jr): Converted from defensive end heading into 2008, Smith got much-needed experience at his new position by playing in all 14 games. However, Smith did not record a reception and will need to round out his game to make tight end a strength for the Pirates. Michael Byrd (RS-So): Byrd came into the program highly-touted but has been injured most of his career so far. Fortunately for the Pirates, Byrd was able to see action in the final 6 games of the season. He returns as the second-most experienced TE in the program. Kevin Gidrey (Jr): Gidrey would likely excel in the TE position, but his value as the number one blocking back would make this move one that could hurt the Pirates running game. If there is a viable backup fullback, then Gidrey could go a long way in fast-fixing the TE position. Most likely, he will be used in the H-back mold made by former standout Jay Sonnhalter, allowing Gidrey more playing time across multiple positions. Will Towery (RS-Fr): A lot will be expected of Towery, who should be a good all-around TE should he get PT in the position. It is more likely that he will mostly play tackle, but because of depth needs, Towery may actually play more TE than originally thought. Position Analysis – Of all the offensive positions, tight end is definitely – going into the season – a gaping hole in the team’s 2009 outlook. When the most experienced tight end you've got was a defensive end a year ago, you know that you gotta work hard in the off-season to shore up the position. Smith proved he can be a good blocking tight end, but for an offense that was reliant on a pass-catching tight end, things are not going to be so dependable. There has been talk about Gidrey possibly adding tight end to his repertoire, but that could come at the price of eroding some of his effectiveness at fullback. The best case scenario is that Smith emerges in the running game and that a player like Byrd emerges as a pass catching threat. Sean Allen (Sr): Allen returns for what should be an all-star season. He started all 14 games – ahead of two experienced centers – in 2008 and earned All-C-USA honors. He is as good as any center in the league. Stephen Heis (Sr): Heis provides a game-tested veteran to back up Allen in 2009. He saw action in eight games in 2008 and demonstrated that when he steps in, there is little discernable drop off in production. Position Analysis – Once Allen settled into the starting position, the center position immediately became a solid position for the Pirates. With Heis, an experienced center to back up as needed, the Pirates are stout in the middle. To make the position stellar, ECU will need a young offensive lineman to emerge as a center-in-training for the future to provide necessary depth. Doug Palmer (Sr): A 12-game starter, Palmer is considered one of the rising talents at guard in the country and is already on NFL radar screens. He is as good as any guard in the country. Corey Dowless (Jr): On the other side, Dowless started all 14 games and showed he is equally up to the task at guard. Along with Palmer, the Pirates have a superior duo at the guard spots. T.J. Harper (TR-Sr): The transfer played in all 14 games backing up both guard spots and will compete – as he did in 2008 – for starting action throughout the season. Harper is very good and gives the Pirates high-quality depth at the position. Doug Polochak (RS-Jr): The Pirates need Polochak to step up his game. He saw action in only one game in 2008. Healthy, he should be a serviceable backup. Dalton Faulds (RS-Fr): Faulds was a ranked by ESPN to be among the top 25 guards in the country coming out of high school a year ago. Faulds should have the luxury of working into the lineup behind Palmer or Dowless without the pressure of having to make immediate starter-like impact. Position Analysis – Ideally, the Pirates would have one more experienced backup heading into the 2009 season. The starters are as good as any in the country and the primary backup is also very talented and very experienced. The quality of the position lies in the backups and for the position to be solidified, another guard must emerge. The likely player is Faulds, who is bull strong and highly-touted. Barring injury, the guards are a major strength for the Pirates. Terrance Campbell (RS-Sr): Fully recovered from his heart condition, Campbell started ten games and played in all 14. He regained his form that landed him on the C-USA All-Freshman Team two years ago. Campbell is a fine tackle and will anchor one side for the Pirates. D.J. Scott (RS-Jr): Scott started ten games and played in 13 contests and had a standout season in the trenches. He will lock down the other tackle position to give the Pirates high-quality bookends. Steven Baker (RS-So): The staff is excited about Baker, who played in four games in 2008 but is still very short on experience. He will need to elevate his game in the spring and fall to ensure the Pirates have quality depth that is ready to step in at starter if needed. Travis Melvin (Jr): The staff is excited about Melvin, who started two games and played in six in 2008. He has all the physical tools, but like Baker, is very shy on experience. Position Analysis – There is a lot of talent at tackle for the Pirates and the front line guys are as good as any in C-USA. The backups are very talented but inexperienced. The position is a bit of a question mark primarily because there was a noticeable difference in the line’s performance when outgoing senior Stanley Bryant was out of the lineup. The expectation is reasonable that Campbell and Scott will improve in the off-season and that the backups will improve, but until it is validated that this group has indeed improved from top to bottom, the position will remain a question mark for the Pirates. Ben Hartman (RS-Sr): While he missed part of the 2008 season with a groin injury, Hartman returned to action and kicked the way he did in 2007. Unfortunately, the hope was that his cardiac-testing inconsistency would have disappeared… it didn’t. Hartman, for whatever reason, still misses seemingly easy kicks and then turns around and hits game-winners as time expires. He has proven that he has ice in his veins when the game is on the line, but he also has put the team behind the 8-ball at times, missing the routine kick and killing momentum. The team needs Hartman to put it all together in 2009. Ben Ryan (RS-So): Ryan got much-needed experience, though the results were not stellar. Still, that said, getting on the field and kicking against the likes of Virginia Tech and West Virginia should pay dividends down the road when he needs it most. The game experience alone should make him much more valuable in 2009. Position Analysis – This depends on whether or not you are glass-is-half-full or a glass-is-half-empty type of person. The former would say the position is well in hand as a two-year starter will return for his senior year. The latter would say that Hartman has been erratic to the point that in many of the games that he was the hero, it was only because he missed easy field goals during the game that would have negated the need for a last-second game-winner. And with a new deep snapper and maybe a new holder, Hartman will really need to become rock-solid steady as timing will likely need work early in the season. Until Hartman proves he can be consistent, this position is at best, a caution position for the team. Carolina Defense, Will Appear on Thursday. Send an e-mail to Ron Cherubini. Dig into Ron Cherubini's archives.